Police are investigating after a cash point was blown up at a Sussex railway station in the early hours of this morning (January 31). The ATM at Bexhill Railway Station is reported to have been “obliterated” in the incident and part of the station roof was also damaged. Resident David Stappleton Tweeted this morning: “Looks like the cash machine has been hit at Bexhill train station. Massive explosion at 4am this morning. Reports suggest a gas canister may have been used in the incident. Sea Road was closed until around 9am. A Southern spokesperson said: “The explosion caused extensive damage to the front of the station, its canopy, lights and doors. “At the moment the station forecourt and booking hall are closed and cordoned off by the police but none of our trains have been affected and no-one has been delayed as we have been able to let our passengers into the station through the side gate. 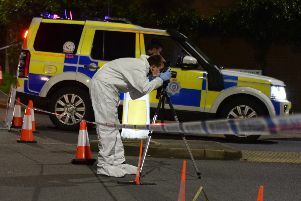 A spokesperson from British Transport Police said: “Just after 4am this morning officers from British Transport Police were called to Bexhill station following reports that a cash machine had been raided. “The cash machine had been blown up resulting in a number of windows shattering; at this stage it is unclear how much cash was taken. “Detectives from BTP are currently leading the investigation and are examining multiple lines of enquiry to establish exactly who is responsible. “Were you in the area at the time or did you see what happened? Get in touch, as your information could be vitally important.” Anyone with any information is asked to send a text to 61016 or call 0800 40 50 40 quoting reference 48 of 31/01. Alternatively, pass information anonymously to independent charity Crimestoppers on 0800 555 111. Video by David Stappleton. Photos by Justin Lycett.